Someone stole 33,000 Mexican pesos (1,800 US dollars) from the account of Alejandra, who died in the 7.1-degree earthquake of September 2017, through purchases in Zara and Best Buy. “I lost everything: my house and my daughter Alejandra. And moreover, after she died in the earthquake, she was robbed of her savings of 33,000 pesos, because someone found her card and emptied the account”, according to Maria del Rosario Cristóbal and Porfirio Vicente, the parents of Alejandra, who had to face another punishment in addition to finding their daughter dead by the 7.1-degree earthquake struck on 19 September 2017. Alejandra was a Sociology student in the Autonomous University of Mexico (UAM) and did not attend her classes on that Tuesday because she decided to stay at home to study. His department was part of a five-storey building located in ‘Colonia Navarte’ which collapsed at 13:14 of that fateful day. Only this family lived in the building, the rest was occupied by some offices and businesses, and only ten people died, including Alejandra. One week after, her parents went to the bank where their daughter had an account to close it, but “we realized that they had taken money from the account”. At the bank, the HSBC branch in Parque Delta, they were told that there were five movements at the weekend. 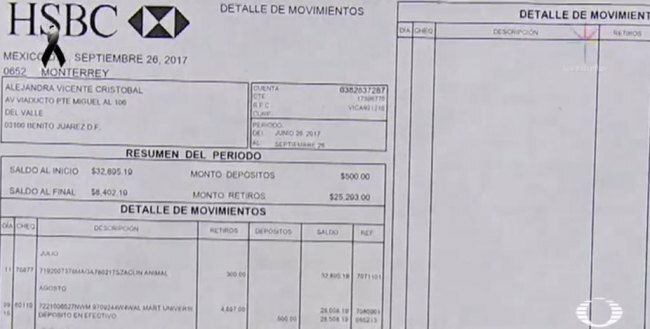 Someone spent 33,000 Mexican pesos (1,800 US dollars) of the Alejandra’s account through purchases in Zara and Best Buy. Porfirio describes how he got that money through the years, by depositing in the account of her daughter 100 or 200 pesos each time, since she was born. “The savings were growing, and she grabbed some money to buy her school expenses, the University, her clothes, …”, according to Porfirio. “She used to ask me permission to spend that money, and I told her it was her money”. The bank offered to conduct an investigation in the next few days, but they did not confirm that Alejandra’s family will recover their money. HSBC did not give details of the branches where the purchases were made. “Those who stole the money have no ethics, they are crooks. However, security protocols are needed. If commercial stores, self-services, any store, charge with a credit card, the should ask for identification and check the signature”, according to Maria del Rosario. There is much information in Televisa’s website.